09.05.2016. Employees of the Friedhelm Loh Group teamed up with members of the Group’s Seniors’ Club to give back to the community. The volunteers came together to help complete the new wooden lodges at Oberndorf Youth Retreat. This unique centre is supported by the Rittal Foundation. Current and former employees of the Friedhelm Loh Group provided their time and skills free of charge, but took great pride in their efforts. A group of volunteers, comprising Peter Dalla Villa, Jürgen Graf, Horst Besserer, Dieter Hast, Rainer Herget and Markus Betz, willingly sacrificed two Saturdays for a good cause. They rose in the early hours of the morning, jumped in their cars, and travelled to Oberndorf. Here, a youth retreat’s new wooden lodges were awaiting much needed and eagerly anticipated work on their interiors. This entailed a considerable amount of manual labour on the part of the current and former employees of the Friedhelm Loh Group. But they arrived motivated and eager to be of service: “We came here knowing it would be hard work. But we are happy to be helping those in need,” explains Rainer Herget, who, as a technical support agent, is more accustomed to holding a phone than a hammer. 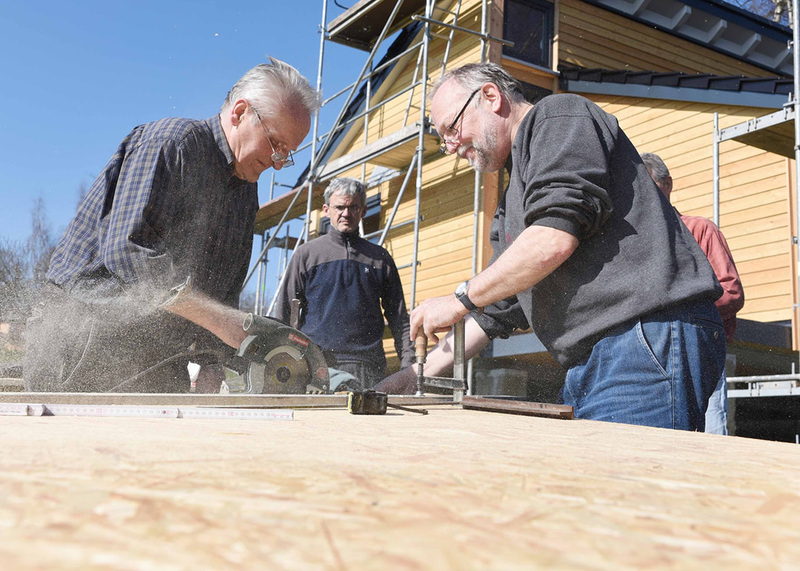 The youth retreat, overseen by local evangelical parishes in Biedenkopf-Wittgenstein, Lahn-Dill District and Westerwald, had used donations to build three new wooden lodges. But initially, only the shells of the buildings were complete. Volunteers rolled up their sleeves and got to work cutting plasterboard to size, and then installing it and insulation materials to create walls. All of this was no problem for Seniors’ Club members. They applied the skills gained in their professional lives to this out-of-the-ordinary project – and found great satisfaction in the experience. Whether taking measurements, sawing, hammering, or wiping the sweat from their brows, there was always a smile to be seen. At the end of the first day, the interior walls and structures in one of the three houses were finished – and the team was visibly proud. Work continued on the second Saturday with the help of further recruits from the Friedhelm Loh Group. Ralf Scheffler and Friedemann Hensgen joined the ranks of enthusiastic volunteers to complete the walls, paint them, and install modern furniture: “With its camping area, communal rooms, a kitchen, washrooms and, last but not least, attractively designed lodges, the youth retreat now offers a wide and exciting range of outdoor activities,” states Hensgen, clearly pleased with the noticeable improvements. Around the half of the visitors to the youth retreat are connected to Christian organisations, such as the German YMCA, churches and the local evangelical parishes. The others are school children and members of non-profit clubs and associations. On multiple occasions, the facility played host to children from the area sur-rounding the power plant in Chernobyl, Ukraine, where the nuclear disaster occurred 30 years ago, on April 26, 1986. The Rittal Foundation has been supporting regional social and cultural projects in the local community since 2011. The foundation was established by Friedhelm Loh, owner and CEO of the Friedhelm Loh Group, to mark the 50th anniversary of Rittal, the Group’s largest subsidiary. The foundation’s charitable activities focus on Central Hesse, where the family-owned business is headquartered. 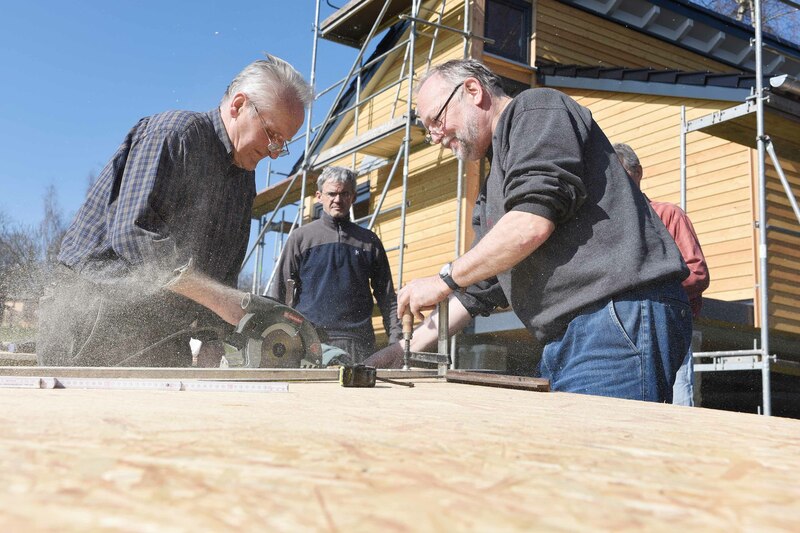 Image: Working for a good cause: current and former employees of the Friedhelm Loh Group help complete the interiors of the wooden lodges at the youth retreat near Oberndorf.